The traditions of many Indian nations state that the People have always lived on the North and South American continents. Scientific evidence shows that Native Americans were living in North America between 12,000 and 25,000 years ago, and some evidence suggests they were here even earlier (this doesn't disprove traditional beliefs - this is simply what science can prove at this point in time). This was during the last Ice Age when a large ice sheet covered much of North America and the world's sea level was much lower. Most archaeologists believe these people crossed over the land bridge which existed between Alaska and Asia. 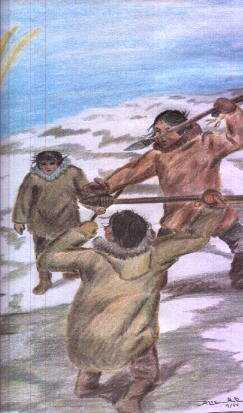 These first Americans are referred to as Paleoindians. Paleoindians hunted the large animals that thrived in the cold climate of the Ice Age, such as the mammoth and mastodon. They depended on these huge animals for food, clothing, shelter, and tools. Never settling in one place for very long, they followed the animal herds as they wandered across the North and South American continents. Paleoindians made tools from animal bone and stone. Awls and needles made from bone, along with thread made from animal sinew, were used to make warm clothing from mammoth and mastodon skins (see illustration at left). Stone tools such as axes, knives, and spear-points were used to kill and butcher the big animals. One type of spear-point, the Clovis point, was made with a groove, called a flute, on both sides. The flute allowed a more secure hafting of the point to the spear shaft, and also increased the penetrating power of the spear. This technological innovation improved the efficiency of the hunter's spear, making it a better weapon for taking the big-game animals of the Ice Age. The fluted point was a Native American invention - the people living in Europe and Asia at the time didn't use the technique. Although the Clovis point was first discovered in New Mexico, points of this type and other tools used by the Paleo People are found all over North and South America, including Nashville and other parts of Tennessee. Amateur archaeologists recently discovered an important Paleoindian site near the Cumberland River about 5 miles from the city. Clovis points found there may turn out to be the oldest points of this type yet discovered. This could mean the Clovis culture began in the Southeastern United States, maybe even in Middle Tennessee, and spread over two continents. The Tennessee Division of Archaeology is studying this site.